Apply now to the Teaching Academy Program! 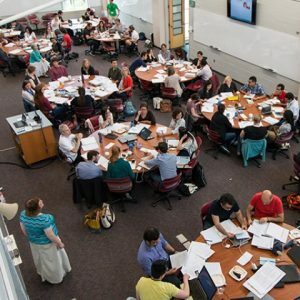 In response to the increasing demand for professional development opportunities to prepare our graduate students and postdoctoral fellows as future faculty, the Teaching Academy expanded this past year to offer its workshops and 3-day Teaching Institute on both the Homewood and East Baltimore campuses. Be sure to check out the recent HUB article that features the 3-day Teaching Institute and the expansion of the Teaching Academy here! Haven’t heard of the Teaching Academy? This professional development program offers doctoral students and postdoctoral fellows from all Johns Hopkins divisions, instructional training and academic career preparation opportunities through courses, workshops, teaching practicums, teaching-as-research fellowship appointments and individual consultations. While academic preparation at a doctoral level primarily stresses research, PhD candidates usually graduate with little preparation – if any at all – for effective teaching, a skill necessary for those who intend to pursue careers in academia. The Teaching Academy offers participants training opportunities to acquire the critical skills needed for their initial faculty appointments, as well as certificates to help provide an added advantage in today’s competitive job market. The program is open to all 2nd year Ph.D. students and post-docs across the University. Applications are currently being accepted through September 2017 for the 2017-2018 cohort. For more information about this program and to apply, click here.